Change by its very nature is an exchange of give-and-take. The changes of geography, calendar, family, or friendships all bring something to gain and something to lose. If there is no plus or minus, then there is no change. Life remains the same. And of course it never does! With my permission or without, change occurs constantly. Since change always carries a ledger measuring credits or debits, we resist and avoid the transitions. Obviously, we don't mind the gains—a bigger house, higher income, enlarging the family by marriage or birth. We embrace the additions. It’s the subtractions we shun. Instinctively we recognize that change will take something from us. If we move to a larger house we may lose the old neighbourhood. When our children marry we hear the cliché, “Gain a daughter and lose a son.” Every parent discovers that the addition of a child will rob you of sound sleep. So, change is hard. That’s true in family, at work, or in our congregations. It is equally true within our own body and soul. My body experiences change daily. I gain pounds and wrinkles. I lose follicles and flexibility. Frankly, the physical process of change is hard to smile at. Mass media point to my past. It shows me who I used to be, or at least thought I was! Smooth of skin and fleet of foot. I look at my grandchildren and remember running on an endless reservoir of energy. I look at my aged parents and weigh the subtractions waiting in my future. The flip of calendar months do not offer my body many credits in the aging ledger. It looks like debits from here on. No wonder our culture is enamoured with youth. Who wants to live on a reducing graph? We grasp and grip in a tug-of-war with time. But our attempt to stay the same cannot be held. Change wins. We age and decline. Now lest I have depressed you completely—read on! The parade of time does take from us but it ushers in great gains as well. We are more than a body. We are souls. Time does not have the same detracting effect upon our inside as it does our outside. Listen to God via Paul’s quill, “So we do not lose heart. Though our outer self is wasting away, our inner self is being renewed day by day” (2 Corinthians 4:16 ESV). We have treasure in a fragile jar. The currents of time and the opposition of darkness press us. These forces may cause physical injury or remind us of mortality but Paul is adamant. Do not lose heart! The graph of our bodies and the graph of our souls point in opposite directions. Our bodies waste. Our souls are renewed daily. If we review Paul’s thought in this passage, we will hear a repeated theme of glory. God is changing us “from glory to glory.” God holds before us an eternal “weight of glory,” which shrinks current losses to puny potatoes. Paul does not ignore the impact of change in our lives. But he does make a fuller calculation. Our bodies are diminished to the point of death. The daily nourishment of grace to our souls overshadows that loss. Glory illuminates darkness. Life speaks to the final word to death. All of this is theology. Good theology, but it tends to stay in our heads. What practical difference does it make when I confront living changes? Sickness. Aging. Moving. Losing. Injury. Abandonment. Death. How does this truth equip me to navigate the gains and losses of change in my life? 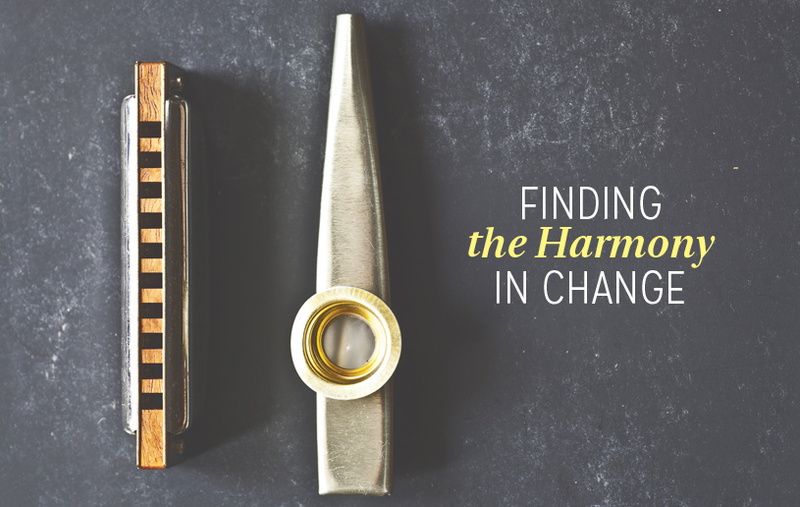 Here is a quartet to lend song in the midst of change. We will need all four to achieve harmony. I can revisit my own values. Holding on to superficial values enlarges my sense of loss through change. If I am bent out of shape about my hair loss more than my prayer loss my balance may be out of kilter. I can recognize that God is always at work for me. Change does not catch God off guard. In fact, He employs the changes of life to shape my soul. It’s one of His favourite tools. Looking beneath the surface of change will reveal God at work. I can be assured by the generosity of God. Here is an unshakable fact: God does not take. He gives. Even temporary losses are building blocks for something good added to our living. I can live in the hope of the end of change. Change is a factor of time. We are headed to an eternal destiny where time ends and so does change. Perfection will not permit gains or losses. The body, which has suffered so much weakness, will be raised to incorruption. Our souls, shaped by daily renewal, will be perfected beyond the effect of change.